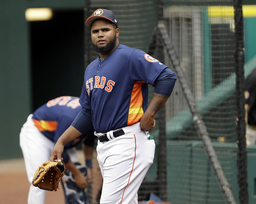 NEW YORK (AP) Injured Houston Astros pitcher Francis Martes has been suspended for 80 games following a positive test for the banned performance-enhancing drug Clomiphene. The anti-estrogen substance is used in fertility treatments and is employed by men to accelerate testosterone production. It is taken along with steroids to inhibit estrogen problems. Houston says in a statement "we hope that Francis can learn from this experience and that he returns to have a successful career." A 23-year-old right-hander, Martes was considered the Astros' top prospect entering 2017 and made his major league debut that June. He was 5-2 with a 5.80 ERA in four starts and 28 relief appearances for the Astros, striking out 69 and walking 31 in 54 1/3 innings. He made four starts last April for Triple-A Fresno, hurt his elbow, and made a one-inning injury rehabilitation appearance for the Gulf Coast Astros on Aug. 2. He had Tommy John surgery on Aug. 15 and was expected to miss most or all of this season. Martes' suspension, announced Tuesday, was the second this year under the major league drug program after Kansas City pitcher Eric Skoglund. Nine players have been suspended this year under the minor league program.